United Way of the Coastal Empire’s campaign is in full speed! At Mid-Campaign, the organization announced that $3,108,760 has been raised toward its $8,251,841 goal. The results were reported at the Mid-Campaign Rally held at the Volunteer Center of America’s Second Harvest of Coastal Georgia. 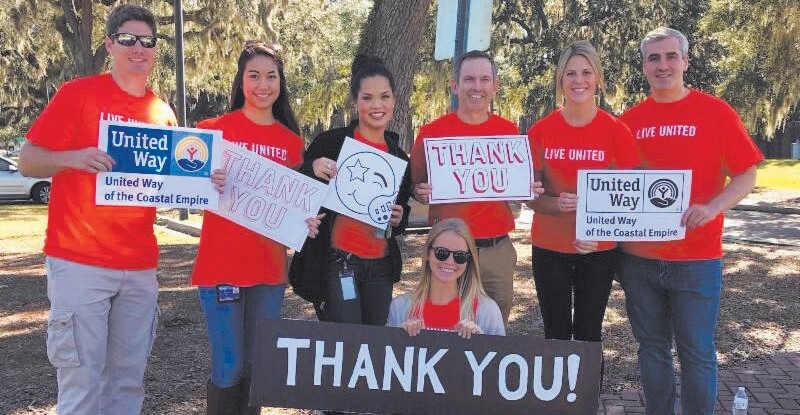 With the help of volunteers and South University students, United Way visited several local businesses and organizations that have held workplace campaigns and held up signs to thank employees. United Way’s unique foundation of workplace giving makes the annual fundraising campaign possible. Last year, workplace campaigns and corporate donations represented 90% of the goal raised. “Those who give to United Way so generously deserve the heartfelt thanks of the community because their individual gifts, often available through payroll deduction, make it possible for United Way to fund more than 100 programs that span across 63 agencies,” said Campaign Chair Dr. Todd Cellini, assistant vice chancellor for South Campuses and president of South University. With one month remaining until the conclusion of the annual fundraising drive, Dr. Cellini encouraged the crowd at the Mid-Campaign Rally to put United Way over the top. Funds raised from the annual campaign help support human service programs that improve the lives of people in Bryan, Chatham, Effingham, and Liberty Counties. A group of dedicated volunteers carefully evaluate requests for program funding to make sure that contributions to United Way are invested the best way to help people. Priority funding goes to programs that support areas of Education and Youth Development, Economic Independence, and Health and Wellness. The final fundraising total will be announced at United Way’s Victory Celebration on Thursday, November 16 at 5:30 pm at Grayson Stadium. The event is open to the public. Tickets can be purchased at https:// www.uwce.org/events/.